This article appeared earlier in the year on Composites World. I do like to collect such articles as they go into interesting depth. Should you need more reading material, I have covered a few design specifics of the IsoTruss here and here. I still feel that the cost and application of IsoTruss to bicycles is simply overkill. Analyzing how this structure will behave is a nightmare from the designer's point of view. Making it is time consuming and proprietary black magic. Imagine taking a space frame and triangulating it to absurd proportions. That is what you get, a structure as complex as the Infinite Isosceles Triangle. Engineers have made this mistake before. You should look up the absurd complexity of the 1960 Maserati Type 60/61 race car, famously known as the "Birdcage" (see right). The Italian designer Rodolfo Maserati probably thought that such redundancy would really give him the ultimate structure. The fact is that failures were common and their repair an absolute nightmare. For a one off car, economics probably wasn't an issue. So I find the IsoTruss much suitable for large structural work and race car applications because those guys have plenty of money to spill. -A tubular, open-truss-structured bike-frame tube that requires less material than conventional solid carbon tubes, reducing material cost. -A finished bike frame as stiff as that possible with aluminum alloys, but lighter, stronger and stiffer than solid tubes of carbon composite or other materials. -A tube structure that isolates crash impact damage, minimizing the risk to frame integrity. Tubular composite truss structures made their debut early this decade. 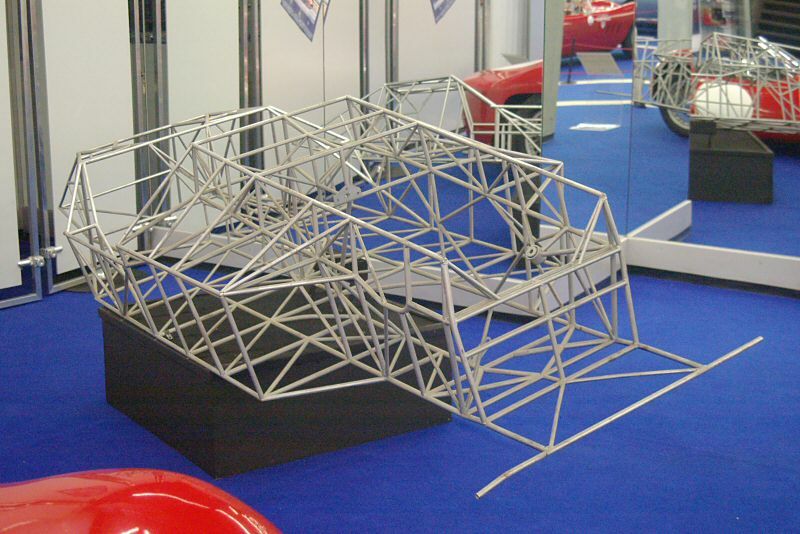 Designed and built at Brigham Young University (BYU, Provo, Utah) and trademarked as IsoTruss, this “open-tube” concept starts with the benefits of two-dimensional isogrid structures — made up of the engineer’s most efficient structural shape, the isosceles triangle — and takes it, literally, to the next dimension. “Isogrid structures were so named because of their quasi-isotropic nature [in-plane],” explains Dr. David Jensen, director of BYU’s Center for Advanced Structural Composites. Jensen coined the term IsoTruss to differentiate the BYU structures from the more traditional isogrid designs. IsoTruss structures feature repeating triangles, similar to the (two-dimensional) triangles in traditional isogrid structures, but arranged in a radial or tube-like configuration in which the triangles form a truss of pyramids that exhibit multiple radial symmetries. The result, says Jensen, is an orthotropic material, which by definition has at least two orthogonal planes of symmetry (with right angle intersections), where material properties are independent of direction within each plane, giving the design performance advantages over conventional solid tubular structures. Although any fiber and resin combination can be used to make an IsoTruss structure, the concept is attracting attention in the cycling community, where carbon fiber composites have proven their worth as weight savers. The IsoTruss geometry forms what is at once a supremely functional and visually striking feature of custom carbon-composite bike frames built by Delta 7 Sports (Payson, Utah). 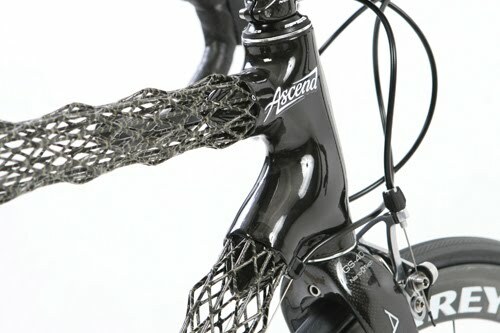 BYU licensed IsoTruss technology to Advanced Composite Solutions (ACS, Payson, Utah), which set up Delta 7 as its manufacturing arm for IsoTruss bicycle frames. Delta 7 began production of its Arantix mountain bikes and Ascend road bikes early in 2009, both types incorporating IsoTruss frames in all sizes. The frame for the road bike weighs in at just over 1,000g/2.2 lb, and the mountain bike frame at about 1,247g/2.75 lb. For comparison, the OCLV 55 tubular carbon composite frame developed by Trek (Waterloo, Wis.) for Lance Armstrong’s 2004 Tour de France Stage 16 uphill time trial, which set the stage for his first-place victory, was 907g/2 lb (see “Editor's Picks”). Finished bike weights are a scant 6,350g/14 lb and 9,525g/21 lb, respectively. Knowing how these forces will interact when connected through the lugs is a critical design factor. Lugs are the cylindrical sleeves that receive the frame tubes at their joints, strengthening the joints and serving to distribute the stresses over their entire area. Delta 7 designs and compression molds its own carbon composite lugs, which connect the frame elements to each other, and to standard sizes of seat posts and other bike parts. The lug slides over the frame truss tube and over the connecting part in conventional fashion. Delta 7 road bike frames have three IsoTruss tubes and five lugs, while mountain bikes have seven IsoTruss tubes and four lugs. The frame design is based on data from two stress-analysis programs developed by BYU. Packer explains, “One is a spreadsheet set up with equations for compression, bending, torsion and tension. We enter the strengths we need to handle the forces and the program defines the amount of material and the thickness of the IsoTruss members required to meet those strength requirements.” The other is finite element analysis (FEA) software designed by BYU specifically for IsoTruss analysis. The FEA assesses failure modes in axial, torsion, bending, shear and local and global buckling. Control variables include fiber type, resin system, fiber architecture in longitudinal members and helical members, geometry of the truss triangle, and diameter and overall length of the frame member. The helical fibers spiral around the edge of the straight, longitudinal fibers in a special filament winder built in-house by Delta 7. It manufactures one truss tube at a time, building up individual rods that range from 2.54 to 3.175 mm (~0.100 to 0.125 inch) in diameter to construct truss tubes that can be 38 to 102 mm (1.5 to 4 inches) in diameter and 152.4 to 508 mm (6 to 20 inches) in length, depending on bike size. Packer says that during the winding process, the spider web-like geometry must be maintained precisely until cure is complete. This requires tooling with tolerances of 0.127 mm/0.005 inch. “The longitudinal members need to be held straight and the helical members must be held straight between the peaks,” he notes. (Peaks are the pyramid-shaped sections that extend out of the truss.) “To achieve that, each peak needs to be suspended at the proper distance from the center of the mandrel tooling.” The mandrel, then, must be shaped in such a way that it will hold each node (the peak intersection) securely in position. At one time, a soluble mandrel was used, which allowed pressure to be applied during cure yet was easily removed afterwards. But that tactic required Delta 7 to cast a new mandrel for each structure. To save time and cost, Delta 7 developed a proprietary collapsible mandrel concept. While the current winding technique is complex and labor-intensive — and therefore expensive — the company has applied an innovative method of consolidating the fibers during cure that Packer says has taken “probably 60 percent of the labor out of the manufacturing process.” Wound trusses are oven-cured at 127°C/260°F for two hours. Finished frames are physically tested by an independent laboratory for compression, fatigue, impact, bending and torsion to ensure compliance with CEN standards. Delta 7 sells complete bikes, combining the frame with other bike components selected by the customer, but also offers the frame alone, for those who want to assemble a custom bike on their own. The IsoTruss frame requires minimal maintenance and has a lifecycle comparable to that of other carbon-fiber frames on high-end retail bikes and considerably longer than a metal frame because the composite is not susceptible to rust or other corrosion. Delta 7, in fact, offers a lifetime warranty on the frame. 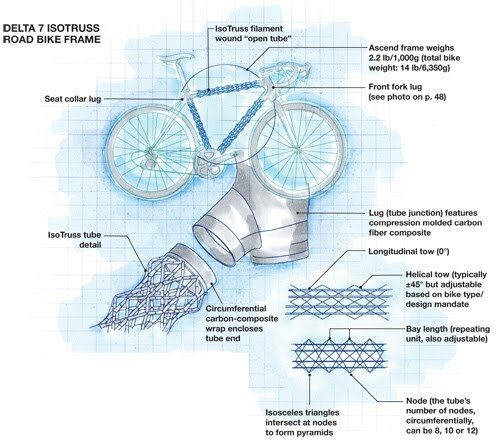 Moreover, the redundant lattice structure reportedly gives the frame greater structural integrity during impact or crash scenarios because, unlike with conventional carbon tube frames, local damage is geometrically isolated, avoiding catastrophic frame breakage. If its promise is fulfilled, the method could save enough in time, reduced labor and elimination of tooling cost to open up a wide variety of future applications in aerospace, marine and energy markets where, if the price is right, these strong, stiff, lightweight structural trusses could open new roads for composites.